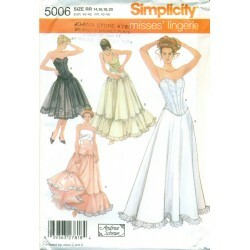 Designed by Andrea Schewe for Simplicity - here is a terrific strapless corset and petticoat sewing pattern. Short or floor length, the petticoat has several different styles of ruffles or none. Version A has an underskirt. Size : Misses RR - 14, 16, 18, 20. See photo for measurements. One of a kind item. As with all vintage items, slight imperfections are to be expected. Anything of note will be mentioned.